“Hillary Runs” is FREE. You can support Hillary Clinton without spending a dime! The game is free to play and ad-supported. We’ll donate 50% of ALL proceeds to support Hillary Clinton's presidential campaign. The more you play the more we pay! Race across the U.S. in this fast and funny mobile game. 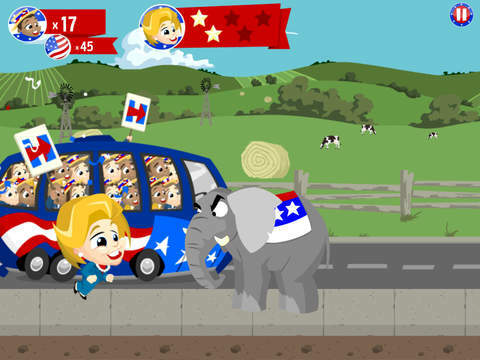 Addictive endless runner game lets you take on the role of Hillary Clinton. As Hillary, you’ll leap over Donald Trump, Republican elephants, protestors and other obstacles. Along the way collect enough delegates and votes to Dump Trump and get Hillary back to the White House! * Easy and intuitive game controls: just tap and jump! 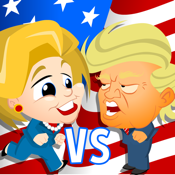 * Gameplay matches the real 2016 election – you better win Florida! Hillary Runs was developed and self-funded by two independent Hillary Clinton supporters! 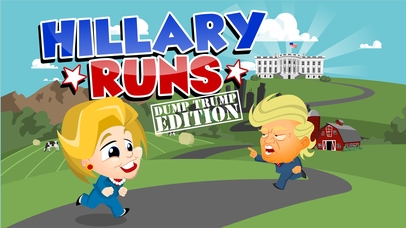 50% of all proceeds from the game will be donated to support Hillary Clinton's 2016 campaign during her run for the presidency. Hillary Runs is not formally connected to the Clinton campaign. Happy Running! Together we can Dump Trump!